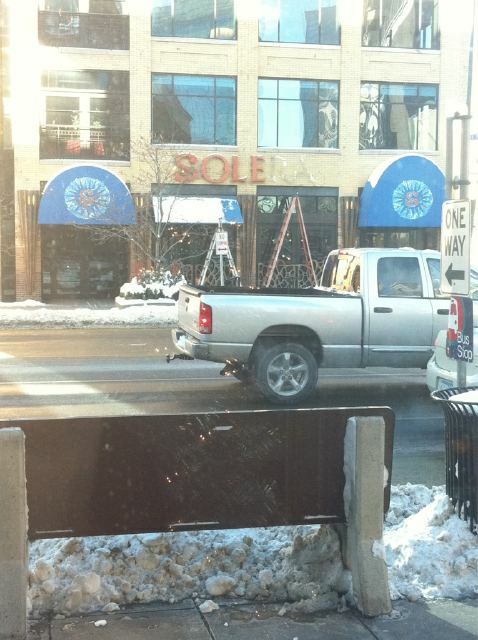 While at work across the street at D'Amico Kitchen, Bryan Gerrard snapped this photo of the Solera sign being taken down. The restaurant has been sold to a subsidiary of the Hennepin Avenue Opportunity Fund and will now be operated by Graves Hospitality Corporation. Goodbye delicious sangrias and movies on the roof! Update: Jeff Fisher, Solera's General Manager, checked in the comments section to let us know that Solera is "very much open for business under new management" and the sign is simply being outfitted with new LED lights. Yay, sangrias! Not closing. Only having building cleaned. Solera is very much open for business under new management by Graves Hospitality Group. The sign is being outfitted with new LED lights and is part of efforts to ensure that Solera goes forward in the manner and level of execution that Graves Hospitality has been known to deliver. Come join us at Solera for New Year's Eve with two floors of food, live music and open bar from 9pm - 2am. Tickets are available at www.Tempotickets.com.